Written by Milou Odekerken on 21st March 2018 . It is nothing new for companies to offer ways to get in touch with someone from their team for any questions or comments. You can speak with a team member from Vodafone about your mobile contract, search Spotify for your favourite music or ask Apple what’s wrong with your Macbook. You probably experienced this: it’s quick, simple and easy. However, did you notice that sometimes answers can be a little strange? Not fitting the question? Or maybe you don’t get an answer at all? There’s a big chance the person behind the other screen is not a human, but a chatbot: an automated conversational partner. If you haven’t seen it, read our previous article on chatbots in eCommerce here. It’s becoming easy to build your own chatbot with services like Quriobot. 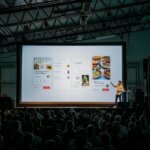 But do you know how chatbots can help your eCommerce grow? Keep reading, because at the end of this article you will know how and when a chatbot helps you grow online. One of the most important things you should think about when implementing your chatbot is its tone of voice. This doesn’t mean you need to choose between a male or female voice, but how your chatbot reacts to customers. Is this tone serious, funny or a combination of both? Does your chatbot show empathy, or does it not show any emotion at all? There is not one correct answer to this question, because it completely depends on the situation and context where the chatbot is used. Let’s tackle this. 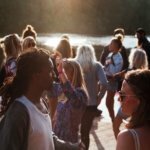 If your chatbot helps people that have questions about their bank account, it will have a more serious personality than when your bot helps people find a concert. MailChimp developed a platform called Voice and Tone, where you can find what tone of voice is suitable for your use case. 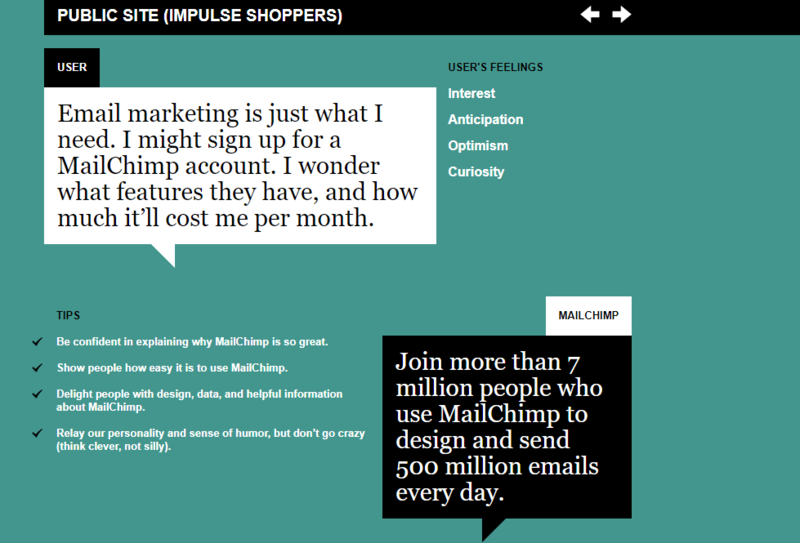 For example, for a public site visited by impulse shoppers (e.g. a webshop with gifts) you can use some sense of humour and show your personality. For legal content, on the other hand, you should stay serious and don’t joke around. Another way that could help you select the right tone of voice is to think about your product as if it was sold in a real-life store: how would you like your customers to be approached by your salespeople? When Quriobot created a chatbot for the Dutch travel insurance company Interpolis, their chatbot showed some personality. If you say your holiday destination is Italy, it responds with “Nice! I’ve heard some nice things about Italy”. However, it still reacts professional enough to give the customer trust and clear guidance in choosing their travel insurance. As more and more shopping takes place online, webshops are growing rapidly. 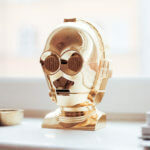 Especially for this kind of eCommerce, chatbots can be useful in assisting and delighting the customer. This will lead to more sales. Chatbots can already recognize human personalities. This study found that personality recognition of the customer can have a significant, positive impact on webshops and improves customer satisfaction by 26%. Use this! They concluded that the funny voice is more effective and leads to more forgiveness in moments where the user is clearly pushing its boundaries. A sentence like “I would like to meet you on the moon” doesn’t make any sense to a bot. However, by reacting in a funny way like “I’m also only a chatbot, this concept is new to me” you can camouflage the restrictions of the chatbot in a way that the customer will show forgiveness. In more serious situations, the use of a funny voice is less suited and can even lead to irritation of the customer. If your chatbot can’t find the right answer, a more neutral response is better. Your customer will show more forgiveness if the bot gives a clear answer about what it knows and doesn’t know. Originating from Japan in the late 90’s, Emoji have become incredibly popular and are considered to play a major role in worldwide online communication. This is actually not a strange idea: speech and facial images play an important role in our emotional expression during real conversations. Smartphone developers, computer companies and social media channels allow us to use Emoji to express a certain feeling or emotion. Amongst its popularity, the diversity of Emoji is also growing. It’s possible to send someone a dark-skinned surprised face, an avocado, a bald guy or a peace sign. Emoji even make communication easier in high-stake environments like mental health. For people struggling with mood disorders, it can be hard to express themselves with just words. Emoji can help them express how they really feel. Furthermore, chatbots can give patients instant information. Seeing a real doctor often means making an appointment and getting in line, while a chatbot is available 24/7. They can give a more interactive experience to receive information, complete diagnostic tools and are used for counselling. Research also shows that the use of Emoji improves the overall user experience of patients. 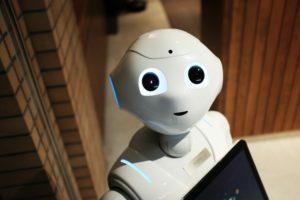 This information shows that chatbots make the lives of patients or people that struggle with their health a little bit easier. 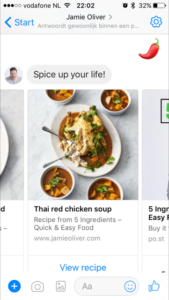 But what about the use of Emoji in a commercial chatbot? One guy we all know gives a great example. 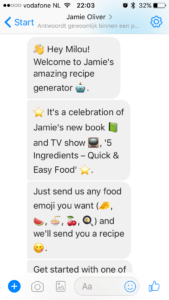 Jamie Oliver’s chatbot asks you to send an Emoji to get recipe inspiration. Are you uninspired but need to cook your mother-in-law an impressive meal? Just send Jamie an aubergine, pineapple or hot pepper and he will tell you what to do. So why is this a good example? The reason is simple: the exclusive use of Emoji narrows down the conversation and makes sure the bot can answer every ‘question’ the person asks. If you ask him a question in words, it will tell you to only speak Emoji. This makes sure the person can’t ask any random or miswritten questions. In return, this is a fun and straight to the point interaction between a human and a chatbot. Flesh and blood or wires and metal? The thing that’s probably most controversial about a chatbot, is the fact that you’re talking to a machine instead of a real human. This machine helps you, gives you answers and all this happens in a nice and friendly way. This might sound strange because machines don’t have emotions or intelligence – as far as we know. Back in 1950 the father of modern computer science, Alan Turing, already questioned whether machines could ever own these instincts. This led to the creation of the famous Turing Test. This method checks whether a computer is able to think like a human. During the test, a computer and a human will individually speak and try to convince a reviewer they are human. If the reviewer can’t decide who is human, the computer wins. So far, some chatbots have passed the Turing Test. Cleverbot is probably the most famous one, passing it in 2011. This test might not be as useful in identifying Artificial Intelligence, but it sure is for testing chatbots. Turing proof or not, something that is more important is whether people care if they are talking to a machine. Does your customer find this annoying and does it affect your sales? Are people comfortable talking to a machine? Research shows that people do send twice as many messages to chatbots compared to people, so apparently, we are not shy towards them. Furthermore, they saw a significant growth of ‘dirty language’ towards a chatbot. This shows they didn’t lose sight of communicating with a computer. The experimenters concluded that many people are willing to have extensive interactions with chatbots, but that computers cannot yet simulate a real human conversation. Another study shows that students’ interest in a learning domain drops if they chatted with a chatbot compared to a human partner, potentially due to a lack of passion. However, it seems that opinions are divided. If people are learning a language, they are more happy learning from a chatbot because they are accessible anywhere and will not judge if you make a mistake. Duolingo is the perfect example that makes it possible to do this. Using the help of a shop assistant also has positive reviews. Users find it easy to use, feel like the computer did all the work for them and found that the system reduced the interaction time. Whether people prefer to talk to a machine or human depends on the situation, the product and the person on the other side of the screen. For eCommerce in particular, it seems most likely that a chatbot is suitable as a virtual assistant for your customer. It can communicate with your target audience, provide customer service, recommend products, drive sales and make sure you can get that extra holiday break you need. 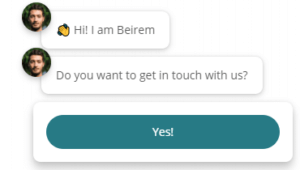 If you visit our website neurofied.com you are able to meet our own founder-inspired chatbot, Beirem. We created him together with Quriobot to determine the interest of our visitor (online marketing, a workshop, or something else?) and to easily get in touch with us. Beirem – as a chatbot – used to be very proactive and social and popped up every page in 7 seconds. We toned him down a little bit: he only says hi now after you’re engaged for a while. In other words, we lowered his intrusiveness. Why did we do this? Imagine walking into a calm shoe shop in London. The shoe shop allows you to take your time and wander around. After a while, the friendly shop-assistant asks if you need any help, but it’s fine if you say no. Now replace this image with a busy market in Marrakech. Traders are trying to sell you their products by holding spices, gold and fabrics under your nose. They don’t take “no” for an answer and give you the best price—or so they say. Which situation do you prefer? Which situation do you think your customer prefers? Exactly! We don’t like to have someone pushing us towards buying something. Our sense of freedom is tainted if people force us to do something. This works the same for your chatbot: don’t make it too intrusive. If people are looking for help, make sure the chatbot is easy to access. Beirem is just one click away. Every time I visit my 92-year old grandma, she asks what my name is at least 5 times. Unfortunately, her brain is not working that well anymore, affecting her memory. 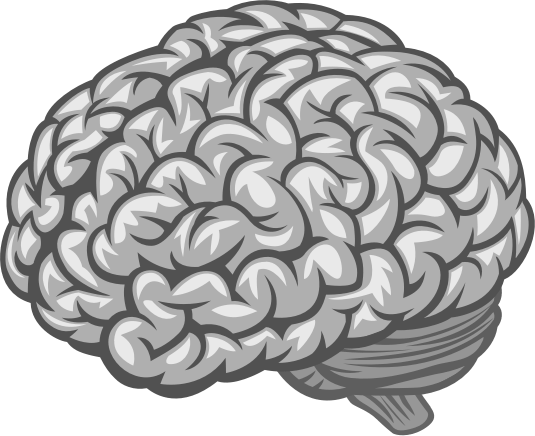 A chatbot shouldn’t have this problem, its ‘brain’ consists of numbers and algorithms. This is why you should make sure your chatbot will not forget your customers details like name, gender or location. Asking for someone’s name makes the conversation much more personal. There’s nothing more frustrating than calling customer service and repeating your details and problem every time you’re being passed on to someone else. If your chatbot is able to remember personal information, it will look way smarter and professional towards your customers. Make sure your chatbot shows a certain level of empathy. No one likes talking to a robot-like person, even if the other person is actually a robot. Use simple and natural-sounding language. Showing off with expensive words and complex sentences will not take you anywhere. Your customers want a quick and easy response to their question. Add some small talk to the conversation to make it less formal and more natural. For example, let your chatbot ask the customer how his or her day went so far. Add personality to your chatbot by giving it a name, picture/avatar and some biographical information. Let your chatbot respond at human reading speed. If your bot talks too quick and too much, the conversation will feel less natural. Still want an expert opinion on building your ideal chatbot? Get in touch with Neurofied and we’ll make it happen asap!